When you want a pristine lawn without the need to fertilize or mow, then Southwest Greens of Bakersfield has your solution: artificial turf landscaping. 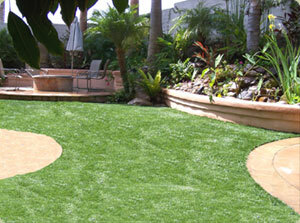 We can give you a lawn that simulates the look, feel, and performance of natural sod for all yard types and sizes. Our turf fibers are soft to the touch and have a natural feel when walking barefoot on the surface. Besides its low-maintenance care, you also get extreme durability for high-traffic uses. This makes it a perfect lawn alternative for active families with kids and pets. Southwest Greens expanded its services into Bakersfield to provide a landscaping alternative for the area. Since California restricted outdoor watering, homeowners are looking at other ways to achieve desirable curb appeal. Our options allow you to have a beautiful lawn without much water and repercussions from your neighborhood HOA. It’s so easy to transition to an artificial grass yard. Our expert installation team can seamlessly fit it into your existing landscape design. You can also opt for a complete lawn overhaul with a complete landscape build. Artificial grass lawns are becoming the mainstream now, and you will save so much time on yard maintenance. Start your conversation with Southwest Greens of Bakersfield today! You’ll be impressed with how realistic our options look and feel, thanks to the decades we spent refining our artificial turf products. Copyright © 2007 Southwest Greens of Bakersfield. All rights reserved.